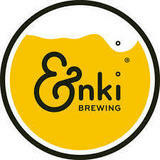 The latest creation from ENKI Brewing, Tail Feather IPA, has officially landed. The beer pours tangerine gold in color and carries a long lasting, silky head. A hefty blend of classic Pac Northwest hops give this beer the robust bitterness IPA drinkers have come to expect.